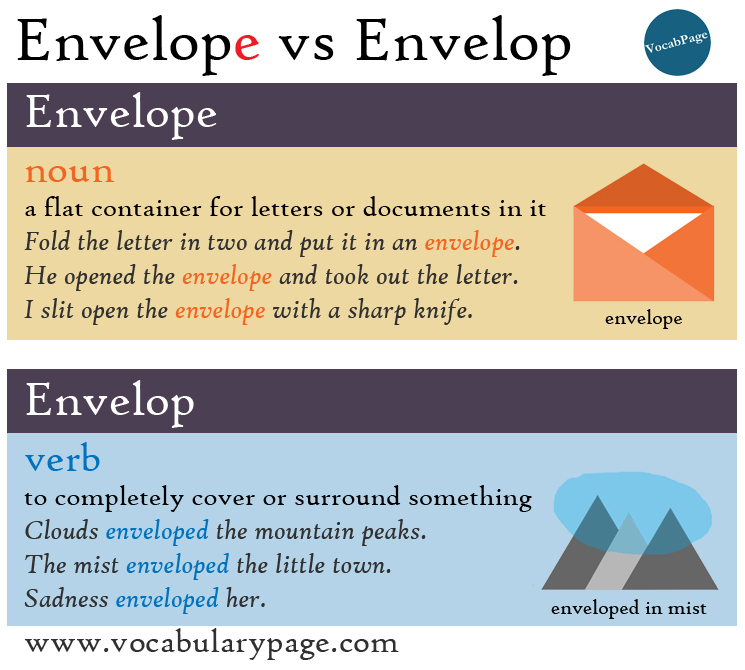 Envelop and envelope are easily confused in the English language. They sound similar but their meanings are different. One is a verb and the other is a noun. These two words are never interchangeable. Envelope /ˈenvələʊp/ is a noun meaning a flat container, made of paper, for letters or documents in it. Envelope is spelled with an e on the end. We stress the first syllable in 'EN-ve-lope'. Fold the letter in two and put it in an envelope. He opened the envelope and took out the letter. I slit open the envelope with a sharp knife. David tore open the envelope and damaged the document. Did you seal the envelope with nail polish? The baby was enveloped in a towel. Clouds enveloped the mountain peaks. The mist enveloped the little town. 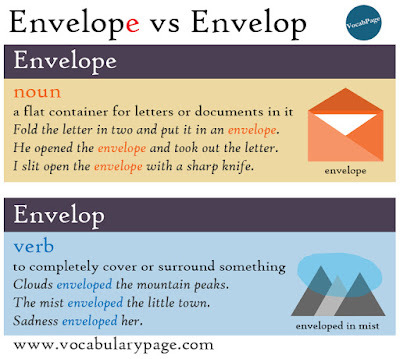 Envelope and envelop are different parts of speech. These two word are pronounced differently. Envelope has an 'E' sound at the beginning, and Envelop has an 'I' sound at the beginning. Thank you for sharing an excellent post on the English Language. Now, I gain some information on Language importance.Speaking more than 2 languages will gives you confidence in your career. Keep on sharing.